Honor Magic 2 specs: The most feature-packed slider phone you’ve ever seen? 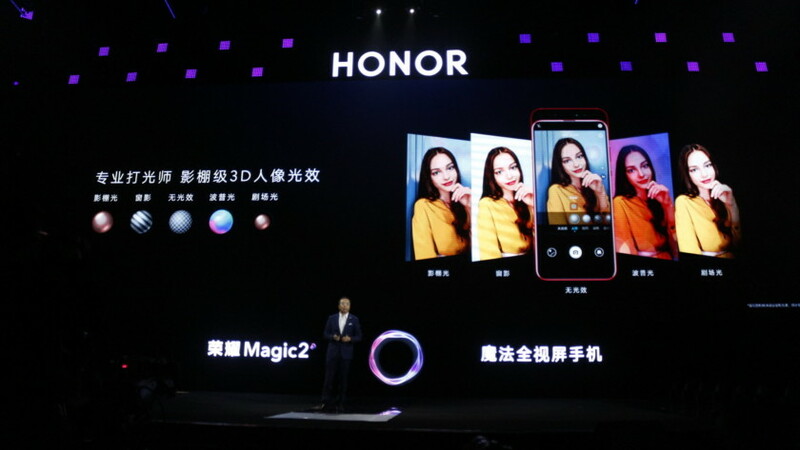 We’ve known about the Honor Magic 2 for quite some time, as Huawei and its sub-brand have been teasing the phone for weeks now. Honor has finally launched the device today, so what does the spec sheet look like? Much like the Mate 20 Pro, you’re looking at a new Kirin 980 chipset, 6GB or 8GB of RAM, and 128GB or 256GB of storage. This all powers a 6.39-inch AMOLED screen (2,340 x 1,080), lacking the notch seen on many other Honor and Huawei phones released this year. So if you wanted the Mate 20 Pro’s horsepower in a different package, this might be for you. The phone also packs six (!) cameras, with three on the back and three on the front, though the rear camera setup differs from all other triple camera phones released this year. While the P20 Pro offered a monochrome/standard/telephoto setup and the Mate 20 series has a telephoto/standard/ultra wide trio, the Honor Magic 2 delivers a 24MP f/1.8 monochrome camera, a 16MP f/1.8 standard shooter, and a 16MP f/2.2 ultra-wide camera (17mm). In other words, you won’t find a telephoto camera here. The front cameras aren’t quite as spectacular as the main cameras, featuring a 16MP f/2.0 shooter and two 2MP f/2.4 snappers. This setup enables high-level 3D facial recognition for 3D Qmoji (and presumably for portrait mode and security features). Speaking of security, the device also offers face unlocking (via IR technology, according to promotional material) and an in-display fingerprint sensor. All of this is powered by a 3,400mAh battery, which is smaller than the P20 series and Mate 20 family. Fortunately, Honor is softening the blow with 40-watt fast-charging tech, allowing the phone to hit 50 percent capacity in just 15 minutes, and 85 percent in 30 minutes. The Honor Magic 2 doesn’t have a headphone jack, so you’ll need to use the dongle included in the box or switch to Bluetooth. Want more Honor Magic 2 goodness, including software features and pricing? Then you can check out our announcement post here.